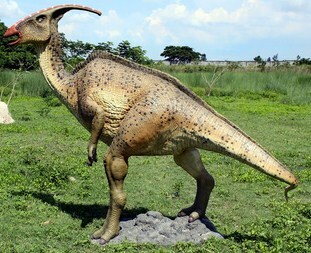 This nearly 8-foot-tall, Jurassic-sized dinosaur once roamed North America! Realistically sculpted with elongated cranial crest and sharp beak, our prehistoric replica dinosaur statue is cast in quality designer resin and hand-painted with powerfully convincing colors and textured to be as faithful as possible to the real thing! This display-quality giant dinosaur sculpture transforms any home, garden, restaurant or hotel into something truly prehistoric! Another breathtaking offering from Gondwanaland Trading Company! Contact us with your zip code and we will calculate shipping charges for you.